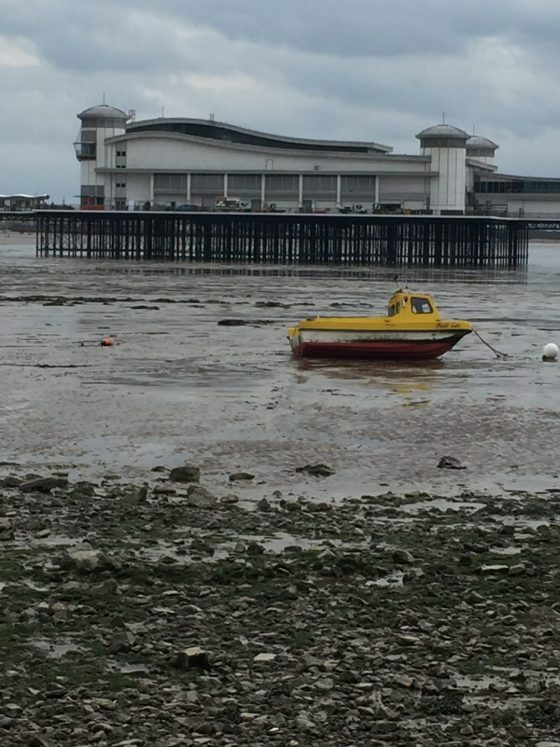 Weston-Super-Mare is famous for two things. John Cleese (it’s his home town) and Banksy (who set up a pop-up art piece called Dismaland here, which attracted everyone from Brad Pitt to Damon Albarn). 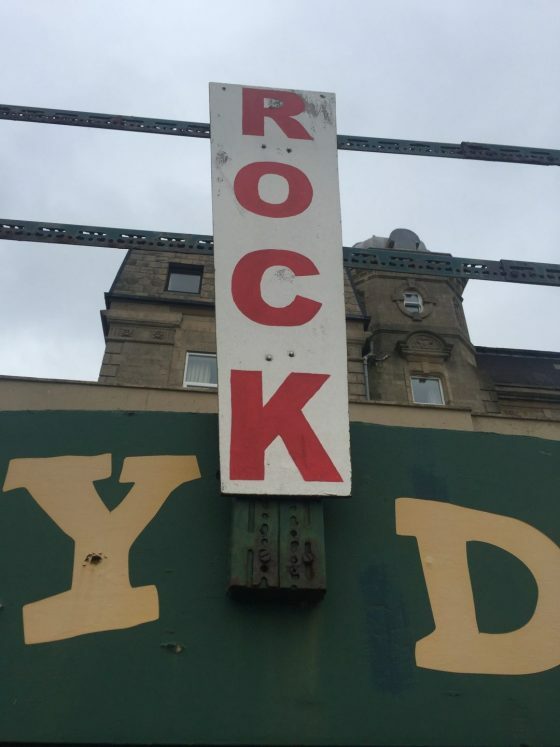 Fans of The Beatles, though, know it as the home of Beatle Rock – one of the best selfie opportunities in the world. Story: Jessica Adams. In the summer of 1963, The Beatles stayed in Weston Super Mare for one glorious week. Between Monday 22nd and Saturday 27th July they played two gigs a night at The Odeon, posed for photographs in Edwardian bathing costumes, rode on donkeys, went go-carting, had their underwear labels pinched by fans – and tried out a tape-recorder in the best hotel in town – with infamous results (more on that later). They also posed on Beatle Rock, as locals now call it, and you can clamber all over it too. A number of photographers tried their luck with George, John, Paul and Ringo that week, including some hopeful locals – and the band’s own favourite – the legendary Dezo Hoffmann. 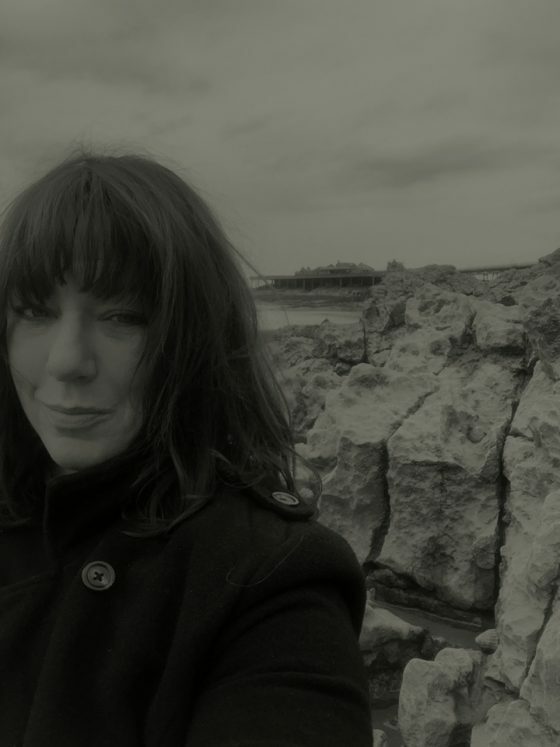 He managed to take out a Super 8 camera and capture them mucking around on the beach in the costumes, which he had hired from a fancy dress shop in London. 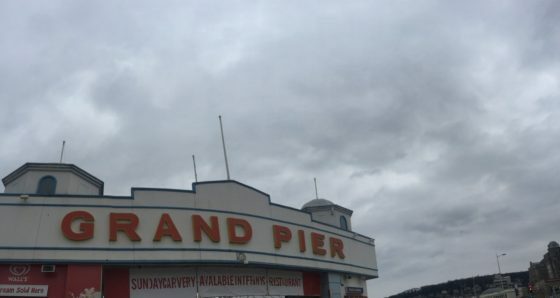 You can see the original Weston-Super-Mare beach film on YouTube and also hear – on the same page – Gerry Marsden of Gerry and the Pacemakers trying out a new-fangled 1963 tape-recorder, at the Royal Pier Hotel. John and George recorded reading psalms from the Bible, and sang The Lord Is My Shepherd and There Is A Green Hill Far Away. It was probably the result of finding a Gideon’s Bible in the hotel room drawer. Years later, when John had stayed in thousands of hotels, he referenced such bibles in a song from The White Album – Rocky Racoon. 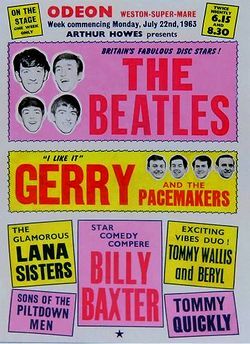 Back in 1963, the band (Britain’s Fabulous Disc Stars! according to the poster) were on stage at 6.15pm, then 8.30pm with Sons of the Piltdown Men, believe it or not. It was the 1963 summer of Roll Over Beethoven – and the screaming hysteria of Twist and Shout. 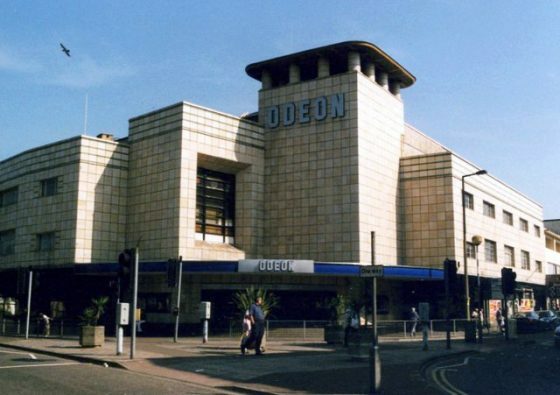 A whole generation of people now in their seventies, still living in Weston-Super-Mare, can remember seeing The Beatles that week, at The Odeon – and some of them saw them more than once. 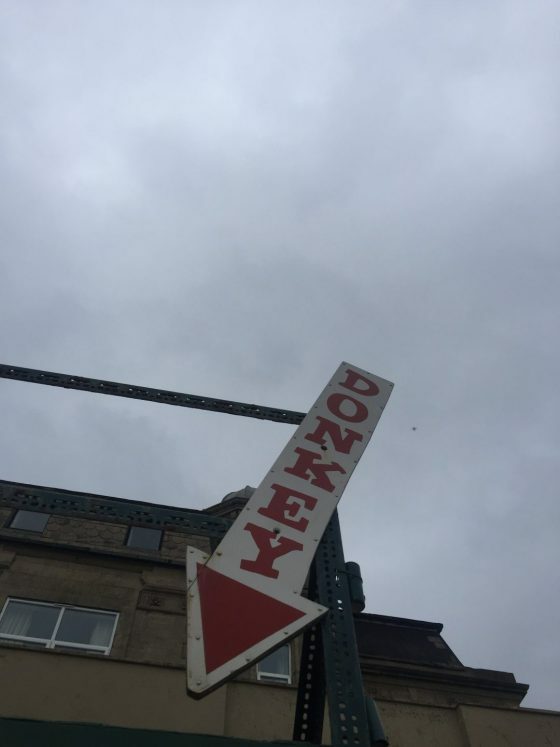 These were the British summers – not of love – but of ice-cream cones with Cadbury Flakes stuck in the top; donkey rides on muddy sand; cream teas with scones and jam; buckets and spades; slot machines – and regular tours by bands. There were beauty contests with Beauty Queens and swimming and diving for all, at every Lido. 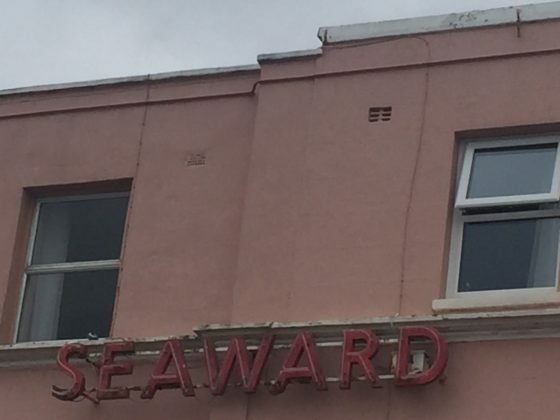 The Lido is no longer a swimming pool and although Banksy took it over for his famously bleak art installation, Dismaland – today it is waiting for its next incarnation. 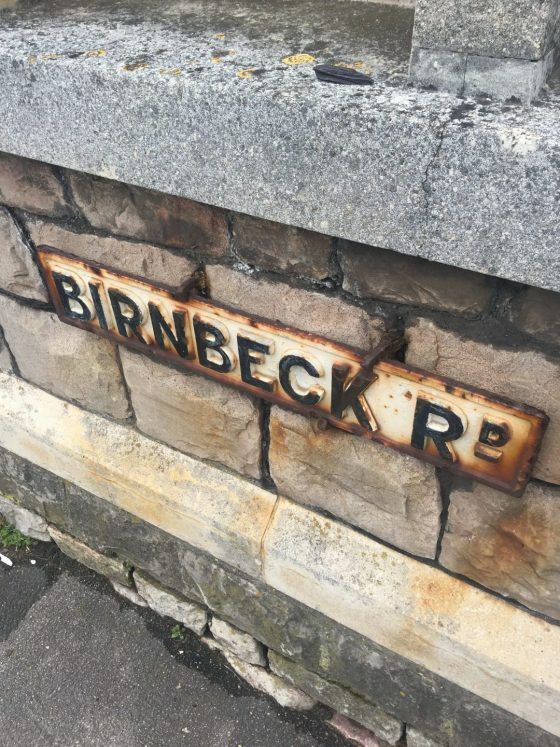 To find Beatles Rock, head to Birnbeck Road (below) and from there, you are minutes from crumbling Birnbeck Pier. 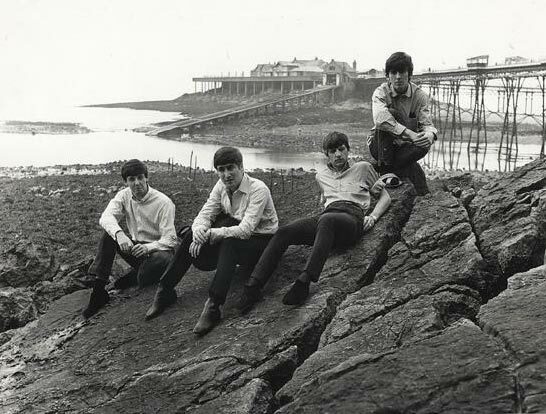 The magnificent pier was open when George, John, Paul and Ringo were asked to head down the slippery concrete stairs and clamber all over the rocks, for a photo opportunity. Today it is closed – though John Cleese and Timothy West have helped to publicise a campaign to save it. (Cleese used to go there with his Dad). The postcard you can buy in the sometimes-open kiosk above Beatles Rock shows the band (George in socks and sandals, the rest in their Cuban-heeled boots) posing as best they could, considering the climb. It’s one of the best selfies any Beatles fans could ever hope to take. The shot below, by G.D. Smith, is on the card. I like it because it shows the band as they probably felt, back in July 1963. Knackered – but willing to do anything – for fans, for local photographers, for Dezo Hoffmann – for success. They didn’t know it here, but they were about to conquer the world.